Considered by many to be the most attractive part of South East England, the South Downs National Park has been designated an Area of Outstanding Natural Beauty since 1966. The South Downs region was awarded National Park status in 2011, making it the newest of the UK’s national parks. The South Downs National Park spans much of the area between the seaside resort of Eastbourne and the city of Winchester which dates back to Roman times. Its 1,625 km2 encompass a wide range of landscapes, from dramatic chalk cliffs to rolling hills in the countryside. It is home to charming villages such as Alfriston, Ditchling and Firle, as well as several historic towns including Arundel, Lewes and Midhurst. The park is situated in the most prosperous of England’s regions, the South East, which attracts millions of tourists every year. Tourism is very important to the area, generating over £2,572 million in income each year. Around 70% of the region is farmed and forests cover around 14% of the land, with the South East region incorporating the four most wooded counties in the country. Where is the South Downs National Park? The South Downs National Park stretches for 87 miles (140 km) across southern England from St Catherine’s Hill near Winchester in Hampshire in the west to Beachy Head, near Eastbourne in East Sussex in the east. In its western half, the southern boundary of the park lies up to 6.2 miles (10 km) inland from the south coast; it thus excludes the major coastal towns and cities of Southampton, Portsmouth, Chichester, Bognor Regis and Littlehampton. 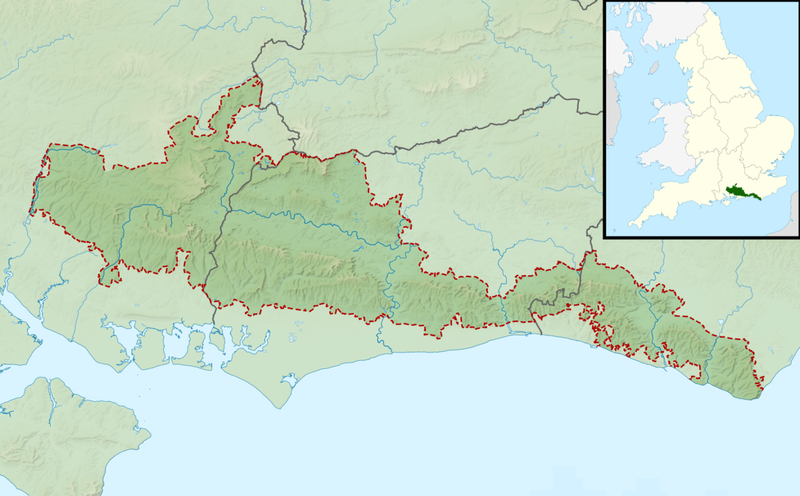 Further east, where the park’s southern boundary lies much closer to the coast, it has been carefully drawn to exclude the urban areas of Worthing, Brighton and Hove, Newhaven, Seaford and Eastbourne. By contrast, the park includes a number of towns situated in the western Weald, including Petersfield, Liss, Midhurst and Petworth, and the two historic Sussex towns of Arundel and Lewes. With over 3,300 kilometres of rights of way and some of the finest scenery in the South of England, the South Downs National Park is the ideal place to go walking and enjoy the breath-taking views. While you’re exploring the South Downs why not have a go at geocaching? There are 30 geocache sites to discover in the park and you can earn extra points if you choose an eco-friendly means of transport or eat at a local café. If you are feeling adventurous, you can walk the whole of the South Downs Way, one of the UK’s National Trails. It usually takes around 8 or 9 days to complete the 160km trail, and you can arrange to have your baggage transported from one stop-off point to the next. There are 1,200 kilometres of bridleways which are open to cyclists across the South Downs, and with 15 cycle hire places in the park, you don’t even need to bring your own bicycle. If you want a long cycle ride, the entire length of the South Downs Way is suitable for cycling. With minimal light pollution, the South Downs National Park is one the best places for stargazing in the South East of England. In 2016 the park was named an International Dark Sky Reserve, only the second such region in England and the twelfth in the world. There are some fine historic estates within the park, including Petworth House and Uppark, both owned by the National Trust. In the historic town of Lewes visit the Norman castle which is set high on a hill and affords wonderful views of the surrounding countryside and as far the sea on a clear day. You can also visit the home of one of Henry VIII’s wives, Anne of Cleeves. The South Downs National Park is in easy reach of central London, and it is also readily accessible from Gatwick Airport. The train journey from London Victoria to Lewes takes just over an hour, and there are also regular services to places such as Brighton, Eastbourne and Winchester, from where you can quickly travel to the South Downs Park by bus or cycling. Make the South Downs National Park the destination for your next adventure and discover a beautiful and fascinating part of England. In and near the South Downs National Park there is plenty to do. From visits to the seaside, to historic monuments, museums and farm parks - there is something for all the family. The South Downs is a national park in South East England. The park comprises of an area of chalk upland whch stretches from Winchester in Hampshire, through West Sussex to Eastbourne in East Sussex. The downs are more open, bare and rounded east of the River Adur at Shoreham, and more wooded west of the Adur. Into Hampshire, the downs lose the steep north-facing escarpment characteristic of the downs in Sussex. Each part has its own beauty due to the variety of geology across the landscape. For those that have the desire, they can travel the entire length using the South Downs Way. The eastern end finishes at the sea from east of Brighton Marina to Eastbourne. The section of cliffs from Brighton to Seaford is largely built on, although the cliffs west of Newhaven (River Ouse) are noteworty for being overlaid by Tertiary sand. “Down” is a southern English term for low to medium-sized hills. Downland is one of the characteristic landscapes of southern England, and is usually composed of chalk, but can also be sandy. The landscape is generally softly rolling, with many ridges and some steeper escarpments, though the peaks rarely exceed 200 metres in height. Apart from the South Downs, downland can also be found in the Chilterns (Berkshire, Buckinghamshire and Oxfordshire), the North Downs (East Sussex, Hampshire, Kent, Surrey and West Sussex) and the North Wessex Downs (Berkshire, Hampshire and Wiltshire). The South Downs are the remnants of the former Wealden Anticline, which stretched across Sussex, The chalk was laid down between 100 and 65 million years ago, on top of the weaker Greensand and Sandstone which makes up much of the Weald, the beds were then folded from 30 to 1 million years ago, the top of the chalk was then eroded, leaving two nearly parallel ridges, which is why the Downs form a long ridge. They are mirrored in the north by the North Downs. The Downs have undergoing inhabitation since the Stone Age, with Britain’s earliest human remains dating from 500,000 years ago found at Boxgrove. The South Downs are home to some of Britain’s earliest mines, numerous camps, barrows, hill forts and figures on the hills. There are remains dating from the Bronze Age to the Second World War; the Battle of Lewes was fought on the Downs and in the Elizabethan times their height was used for beacons (this is preserved within names, such as Firle Beacon). The South Downs extend about 70 miles (100 km) through East Sussex, West Sussex, and part of Hampshire. The South Downs Way is a bridleway that follows the South Downs. The Downs are penetrated by several rivers, such as the Cuckmere (its lower reaches form the famous meanders), the Ouse, the Adur, the Arun (passing through Arundel). The Views from the Downs take in some of the most beautiful countryside in the South East of England.